Approximately 62 percent of U.S. households have a pet. After dogs and cats, any guess as to the third most popular pet? It’s actually fish. According to the American Pet Products Association, there are roughly 12.5 million households that keep aquariums with an average of about 12 marine inhabitants, which calculates to 150 million fish! That’s the backdrop to introducing you to Paramus-based Aquaman’s Reef—the leading company manufacturing luxury, high-end aquariums and an NJBIA member since 1997. Founded in 1996 by Joseph DiTomasso, Aquaman’s Reef does not deal in your average, run-of-the-mill aquariums. No sir, they are one-of-a-kind luxury aquariums often found in multi-million dollar homes and corporate high-rises. And it takes a great skilled team of architects, structural engineers, contractors and service technicians working collaboratively to provide what are really spectacular works of “living art.” Click here to see a gallery of custom tanks from Aquaman’s Reef and I’m sure you’ll agree. Discuss: Meet with the client to discuss aquarium type, location, size and inhabitants. Approve: After meeting with structural engineers, architects and contractors, the blue prints/images are presented to the client for approval. Enjoy: All that is left is for you to enjoy your aquarium. They can make it that easy because they are experts at the highest level of their craft. It may surprise you to learn about the many benefits aquariums provide, starting with their calming effect. That is why you often see aquariums at doctors’ and dentists’ offices. This also extends to office settings of both large and small businesses, where they can provide a short respite for employees under heavy stress. 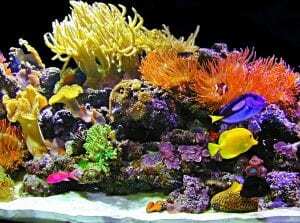 There was even an empirical study conducted by the National Marine Aquarium, Plymouth University and the University of Exeter that found that people who simply stared at a fish tank had their heart rates reduced by an average of 7 percent. Congratulations to Aquaman’s Reef for more than two decades of outstanding success. For more information, visit their website. Aquaman’s Reef is just one of 20,000 companies that comprise NJBIA’s membership, which is very diverse with representation from an amazingly large and wide spectrum of fields, industries and professions. Look for more unique stories about NJBIA members in future issues of “Beyond 10 West Lafayette,” NJBIA’s membership blog.